It says a lot about the strength of Diana Bang’s performance in this one-woman piece (and my shoddy pre-viewing research) that while I was watching it I assumed it to be an autobiographical work, pulled from the actor’s life. I have no way of knowing to what extent the events of Self-Ish, written by Kuan Foo and directed by Dawn Milman, are inspired by the lives of its creative team. However I will say that upon realizing that it is ostensibly fiction rather than autobiographical that my estimation of the play changed, but my appreciation for Bang’s performance increased. 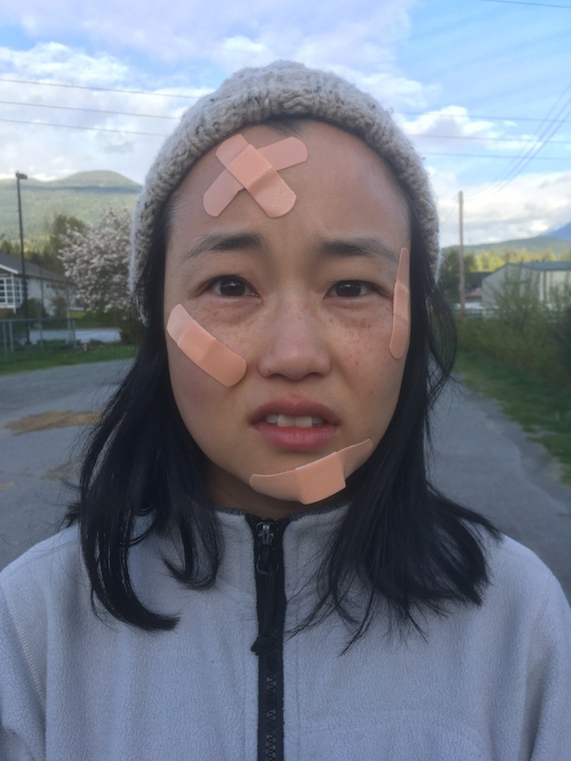 While the work is an affecting though somewhat sketchily composed look at family and purpose, Bang, a magnetic and assured performer, inhabits Esther Jin with charismatic ease. Bang is alone on the intimate BMO Incubator stage save for four moving boxes which are folded, unfolded, kicked and hauled around throughout the show, and as Jin she frames her life through these boxes: constantly unsettled and filled with small histories and sorrows. These are primarily centred around an examination of herself and her family in the wake of a recent tragedy. She discusses her childhood growing up in Korea before immigrating to Canada at age seven, and her anxieties about commitment, mortality, and the expectations others have of her, leading to a sense of being a constant disappointment to her parents, especially in comparison to her conventionally successful and more reliable brother (Jin is currently labouring with little interest as a receptionist for an engineering firm under the watch of a seemingly emotion-less boss). Bang effortlessly exhibits light comic energy while always keeping a tight grip on the depression that appears to haunt her character. Her rapport with the audience is strong throughout, and she suavely inhabits different stages of Jin’s life while also at other moments becoming the various family members and the afore-mentioned boss. Bang doesn’t exactly make these other characters nuanced; rather they feel like they are being imitated by Jin herself, skewered and emulated but not given full dimension (the boss, for instance, is compared physically to an insect, and is performed as such). In a way, that seems appropriate, making Jin’s world as she sees it feel all the more alive, bringing us assuredly into her perspective. However Foo’s script feels a little thin at times: we get the basic dynamics of Jin’s relationship to her family, but they don’t feel fully fleshed out leading up to and in the wake of the central tragedy that anchors the show. Esther’s constant feeling of aimlessness (she is described as “intelligent but unfulfilled”) and distinct but strained relationship with each of her parents are evocatively discussed and don’t necessarily need to be explained even more to the audience, but aspects of the show feel more sketched out than worked through – gaps that might have made sense in an autobiographical solo show here seem like missed opportunities. is it reductive to wonder if Esther has secret dreams for herself that she has struggled or decided not to pursue? What was she doing before working as a receptionist?But perhaps such over-investigation would be inorganic to the story Foo, Bang and Milman are telling. It’s true that we can fill in many of the gaps ourselves. When Bang suddenly breaks into tears towards the end of the play, she movingly conveys Jin’s grief and frustration in a way that a more conventional work might struggle to communicate. So while I still think there’s a more fleshed-out version of this show waiting in the wings, there’s no denying that the one currently onstage is a moving one expertly performed by its star. The above sub-title tells you everything you need to know about the concept, and from it Morgan Cranny pulls off an enjoyable standup show. Assigned the status of #1 Comedian because of an elementary school seating arrangement that determines career trajectories in Soviet Russia (and thus denied his secret dream of being Russia’s #1 State-Approved Gymnast), Vasily is currently touring the world (that is Orlando, Toronto, and Vancouver) while spreading the good word about his country and its glorious President, whose giant photograph sits on an easel next to Cranny for the entire show. Despite Russia being a continuously big news item these days, Vasily mostly avoids anything too topical: he makes only a few vague references to the corrupt leader currently de-stabilizing world order (Putin is referenced a little more). Cranny and director/co-writer Mike Delamont’s concept is set more comfortably in an immediate post-Cold War, The Simpsons-esque world where Russia is a just-defeated Communist power from which Vasily has emerged. It’s not exactly groundbreaking, but that doesn’t mean it’s not amusing. “It is a great pleasure for you to be here,” he announces imperiously at the top of the show, but indeed the bulk of his characterization is more about how innately defeated and worn down Vasily has become. Cranny accordingly gives Vasily a slightly low energy which at a few moments threatens to overwhelm the tone of the whole show, but for the most part he manages to keep the deadpan defeatism funny and engaging. The tragic story of Vasily’s late wife Svetlana provides just enough of a structure to frame the performance, but mostly we’re simply taking pleasure in Cranny giving us this endearing character, one he’s playing for several years. Highlights include inviting an audience member onstage for a language-learning drinking game, and Vasily’s illustrations of Toronto landmarks accompanied by his commentary, including hilariously bemused observations about the ROM. When all’s said and done you might not learn a lot about what’s up with Russia these days, but as Vasily makes clear with his growing interest in Toronto, Russia could certainly learn a lot about what’s up with you. Late-night Fringe shows have their own particularly surreal energy. In the middle of usually muggy summer, the notion of coming together with a group of strangers to see a performance whose quality and energy you (likely) have limited knowledge of, when most people are at a bar or watching the news or preparing for bed, always inspires a certain bizarre magic. So it was at 10:15 on Wednesday night in the Tarragon Extra Space, when audience members gathered in the small venue to watch Amo Gulinello Fastcar. I don’t think Gulinello would profess to say that his show is meant to reach profound depths of surreality and profundity, but he certainly succeeds in developing an enthusiastic communal energy with his audience. A kind of casual clown energy dominates: Gulinello employs mime, props, and limited verbal communication to stage a series of amusing vignettes, all of which are connected to his characters’ obsession with Hollywood action cinema. We get a scenario where he is so obsessed with treating his kitchen like the setting of a slick martial arts-like showdown that he can never reach his ringing phone in time, as well as spy movie like break-ins and seduction of a romantic interest (both scenarios involving willing audience members, whom Gulinello proved himself very adept at picking out). While the first ten minutes or so proved far too stretched out in my opinion, and certain other sections felt a little sketchy in their execution, by the final half the skilled performer had settled into an endearing and very enjoyable rhythm, using a spry athleticism to hightail his way through his characters’ celluloid fantasies, energetically taking us along for the ride.